Mandolin. A gospel choir. Cowbell. Lissie. An orchestra. Bongos. This doesn’t sound like the Snow Patrol you’ve heard on the radio, but the band’s most popular singles have never been truly representative of how broad a range the musicians have. 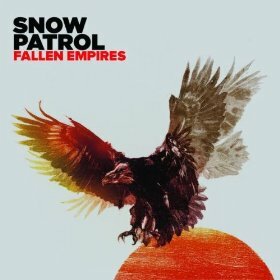 The group’s sixth LP, Fallen Empires, is their most experimental to date, dipping toes into left field without abandoning the group’s signature melody. Opener “I’ll Never Let Go” is a beast of a song, growing from acoustic guitar, churning synth, and distorted vocals to energetic riffs behind a choir belting out. Likewise, “The Weight of Love” is drum-heavy guitar rock that still retains a danceable edge. Then there’s the title track, with its stampeding beats, crazy keys, and claustrophobic vocals that add up to a deliciously weird piece of Celtic electro chaos. For fans of “Run” and “Chasing Cars,” there are still those familiar moments of emotional turmoil. “This Isn’t Everything You Are” is a soulful guiding light that has the potential to be a radio classic, and “New York” is a eulogy of a failed relationship that is so raw that vocalist Gary Lightbody’s voice crackles with barely contained pain. Composers Owen Pallett and Nico Muhly’s influence can also be heard on the album. While strings and brass add gentle dimension throughout the record, the closing track, “Broken Bottles Form a Star (Prelude),” sounds like it could be pulled from a symphony performance, classical but energetic. The song ends all too quickly, but if its name is anything to go by, we’ll be hearing more of this new chapter in Snow Patrol’s sound very soon and keep memorizing their plaintive, universal ballads through album seven and beyond.